Melkote is the abode of Lord Sri Thiru Narayanan Swamy. Sri TiruNarayana Swamy Temple is located in Melkote in Pandavapura Taluk of Mandya district, Karnataka. The temple is known as "Cheluva Narayana Swamy" Temple. The temple town "Melkote" is also known as "Melukote", "ThiruNarayanaPuram". "Vairamudi" Brahmotsavam is the most important Annual festival in the temple. 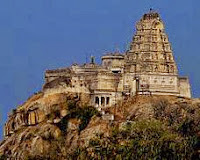 Sri Yoga Narasimha Swamy Temple is situated at the top of Yadugiri hill in this temple town. At the top of Yadagiri hill, Sri Yoga Narasimha Temple is situated. It is about 3000 feet above from the sea level. The history said that Sri Vishu Vardhana Raju was built the temple 1000 years back. The Mysore king Sri Krishna Raja Wodeyar III presented Gold Crown to the temple. By Road: The temple is well connected by road from Bangalore. It is about 150km from Bangalore and 48km from Mysore. Rail: The nearest railway stations are Bangalore and Pandavapura, Mandya district(This station is located b/n bangalore and Mysore rail lane). The temple is about 25km from Pandavapura railway station. Air: The nearest airport is Bangalore.